HORN BETS -- Here you are wagering that the 2, 3, 11 or 12 will be rolled. You can bet these numbers separately or as a group. Unlike some of the primary bets, horn bets are good for only one roll. Either the designated number(s) come up or they don't. LAY BETS -- This is similar to the "place" bet in that you will wager $20 or more, with the object of the wager being a particular number or numbers. You are going to "lay" the number here, which means you'll pay a small commission or "vig" to the house. Here you will win if the 7 rolls before the number you have designated. You will lose if not. You're laying the commission because since you're betting on the seven, you're betting on a combined total that is always going to be more likely to be rolled than any single number you choose to bet against. This bet can be placed either before or after the come-out roll. HARDWAY BETS -- Here you are betting that a total will come out the "hard way," meaning that it will be the product of a pair. For example, if you are betting on "six, the hard way," you are betting that a pair of threes will be rolled. A pair of fives constitutes "ten, the hard way," and so on. In this bet, you will lose if the seven rolls, and lose if your number comes out "the easy way," that is if it happens as the result of anything but a pair. ANY CRAPS -- This is a bet good for only one roll. It wins if a "craps" - 2, 3 or 12 - is rolled. It loses if none of those totals come up. THE FIELD -- This is a one-roll bet as well. If the next roll happens to be a 2, 3, 4, 9, 10, 11 or 12 you will win. If it is anything else, you lose. The rationale behind the casino offering this bet, obviously, is that the number of combinations representing the field numbers adds up to less than the remainder of the numbers do. ANY 7 -- Very simple. The next roll must be a 7. If it is, you win. If it's not, you lose. This bet is good for one roll only. C & E BET -- The "C & E" stands for "craps and eleven." 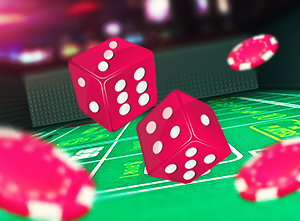 The next roll must be a "craps" (2, 3 or 12) or an eleven. This bet is good for one roll only. BIG 6 -- This bet wins if the six is rolled before the seven. It pays less money than the "place" bet on the 6. BIG 8 -- This bet wins if the 8 is rolled before a seven.